Most people think of Iliotibial Band (IT band) Syndrome as affecting the knee but it can also cause problems at its origin – the hip. 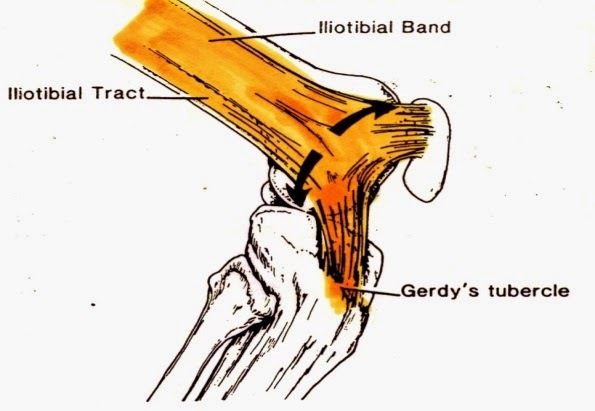 The iliotibial band is a superficial thickening of tissue on the outside of the thigh, extending from outside the pelvis, over the hip and inserting just below the knee. The band is crucial to stabilizing the knee during running. As you can imagine the continual rubbing of the band over bone can cause some pain and irritation at the hip. Pain tends to worsen when you overstride, run downhill and when the foot strikes the ground. For long term treatment have Dr.Rodwin evaluate your biomechanical alignment- she can treat the muscle injury, as well as any joint restrictions which have occurred to the back, hip, knee or foot. The active release (ART) and trigger point therapy are very effective for IT band problems. It is also beneficial to have Keri-Lyn evaluate your gait/feet to see if a custom orthotic is required. Massage therapy performed by our registered massage therapists – Andrew, Jessica, and Ashley can help to release imbalanced and tight muscles. Trigger points are taut bands of muscle usually felt as a palpable nodule. Some causes of trigger points include muscle overload and repetitive strain. Repetitive stress injuries are often the result of computer and assembly line work or the result of repetitive motions related to sports such as running. With repetitive strain injuries the overall goal is pain management and restoration of joint mobility. Massage, acupuncture, chiropractic and ART can help to achieve these goals. Chiropractic treatment addresses all the possible causes of RSI’s. The key is determining where the problem originates. Chiropractic adjustments restore proper motion in the joints and the spine. Acupuncture speeds up the healing process and decreases inflammation by stimulating the natural release of endorphins. Dr. Rodwin is a certified acupuncturist. Massage therapy relieves pressure on the nerves by stretching the tissue responsible and helps reduce scar tissue. Check out this video that explains iliotibial band problems and how we can treat them at Back to Health.